Written by katie sullivan on Thursday, April 7th, 2016 at 9:00am. Listening to Bleached live feels like jumping into the ocean at the beginning of April. It’s icy and startling, tasting brackish and filling your mouth with just a touch of bitterness. But after wading around in a few of their songs and taking a deep breath or two, these punk rock waters begin to feel fine. 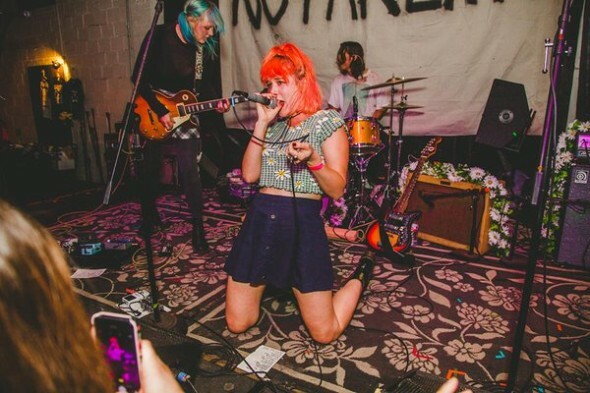 That was the scene for Bleached as they stopped by Walter’s Downtown in Houston, rolling through on their tour for their much-buzzed sophomore album Welcome to the Worms, a sonic creation born from the wreckage of an unraveling life. Which perhaps explains why Bleached’s set started out unwieldy and unwound. The opening song “Trying to Lose Myself Again” emerged with discordant frisson, and the single “Keep On Keepin’ On” failed to rise above its simplistic chord progressions and lyrical shouts into something cohesive and powerful. Lead singer Jennifer Clavin struggled to find her voice in these songs, and the many notes she missed didn’t pass as a punk rock conceit. Things gelled, however, with their performance of the power-stomping hit “Wednesday Night Melody.” The song proved to be a better conduit for the band’s rough edges, pulling the strong, screaming guitar riffs of Jessica Clavin into the foreground. The firm, declarative “ba-ba-bas” that have come to define the band’s ’60s surf-rock sound bonded with the full-throated bass lines from Micayla Grace, allowing the show to finally get its sea legs. From there, the songs began to blend together into a satisfying melange of buoyant riffs in 4/4 time. The band oscillated back and forth in their catalog, from the easy up-tempo love song “Think of You” back up to the crunchy, bass-driven “Chemical Air.” But save a clean, sharp ending to “Sour Candy” (their rocking drug anthem with quiet, beachy interludes), the songs did not distinguish themselves from one another, nor did they compose themselves into some sort of narrative whole. The band’s cover of The Ramones’ “Today Your Love, Tomorrow the World” was stripped down and tight, and clocking in under two minutes, it revealed Bleached’s growing pains. As the Onion’s A.V. Club writes, “Bleached’s style of rock and roll is best suited to short, vicious tracks that get in, chug a beer, high-five the host, then get out.” While The Ramones are a perfect vehicle for this party-crasher style, Bleached’s newer tracks have swelled to accommodate the band’s changing direction. Though the new music is laudable for plumbing into emotional depths, it has drifted too far away from the style that raised so many critical eyebrows. When done right, these rough, raw, yet impassioned songs can produce timeless bands like the Breeders. For Bleached, the music is still a little lost at sea.